Jackie founded Peloton Sports, Inc. in 1998. The office is based in Alpharetta, Georgia, north of Atlanta. Peloton Sports has managed projects for sports and entertainment clients worldwide. For the past 19 years, Peloton Sports has specialized in media relations, publicity and on-site media operations for professional cycling events across the U.S. Jackie has also spoken at a number of public relations and sports conferences, including Georgia Bicycle Summit and USA Cycling Race Director and Team Summit. She is also active as an alumnus of UNC-Chapel Hill in the Career Mentor Program for the UNC Media and Journalism School. 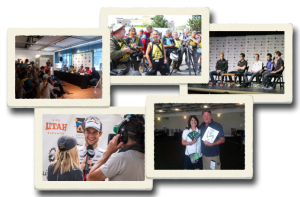 Jackie has also handled public relations programs for sponsors at the Atlanta and Sydney Olympic Games, managed media operations at outdoor venues during the Salt Lake Olympic Games. She has vast experience with a major sporting goods manufacturer and three professional baseball teams. Jackie started in professional baseball, working for four different minor league baseball teams. She was the first woman pictured in a professional baseball card set. Bonyetta is the queen of media pitching. She has vast experience in the entertainment world and has worked a variety of sporting events across the U.S.
Lyne is a former journalist/photographer turned PR pro. She focuses on publicity efforts for clients using social media channels. Becky has an extensive background with endurance events as well as B2B franchise-based clients. She is skilled at writing and strategic planning, and not too bad as a triathlete and vocalist. Jack has valuable experience in the sports world, from the New York Yankees and Atlanta Braves to management with international events like the Goodwill Games and Olympic Games organizing committees. He specializes in event marketing and ticketing as well as radio frequency identification (RFID) technology and solutions for events and venues.